We’ve started with food dads love, then put a spin on the recipes to make them worthy of a Father’s Day tribute. These Maple Bacon Cinnamon Rolls are super-easy and quick to make. The Grilled Cheese Appetizers can be customized with your family’s favorite cheeses. And we’ve got five different ways to make Deviled Eggs. If you’re still hungry, how about one (or more!) of these father-friendly desserts? The classic pairing for a brunch is, of course, the Bloody Mary. 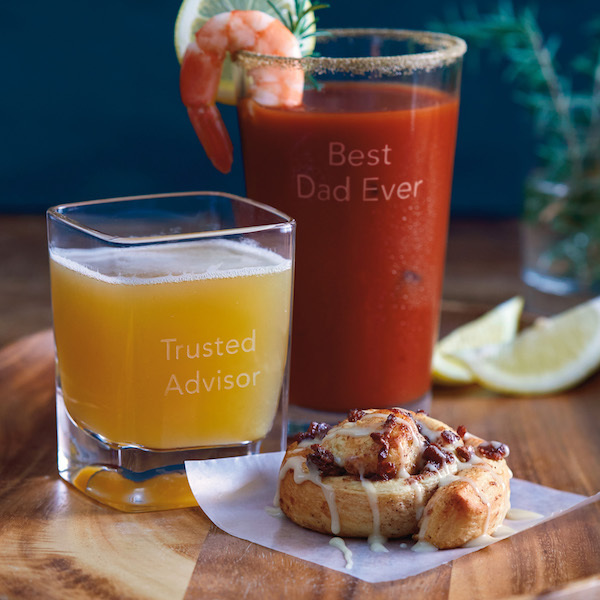 And whether you choose a few key garnishes or put together a Bloody Mary bar, you’re setting Mom and Dad both up for a relaxing morning. If you’re looking for something a little different, serve up one (or all!) of these three refreshing beer cocktails. They’re ridiculously easy to make: Start with beer and just add juice or soda. Looking for more Father’s Day ideas? • Get ideas from Hallmark writers for what to write in Father’s Day cards for all the father-figures in your life. • Make your own Father’s Day gift: Try an easy craft project from Hallmark Designer Em Bronson, or handmade gifts from Crafts Editor Jeanne Field, or learn how to make a t-shirt from our friends at Think.Make.Share. • And, of course, we’ve got lots Father’s Day cards and gifts for every kind of dad.